Location: Situated near the centre of Llandovery on the N side of the High Street between Orchard Street and Water Street. Calvinistic Methodist chapel built as a memorial to William Williams of Pantycelyn (1717-91), the great preacher and hymnodist. Built 1886-8 to designs by John Henry Phillips (b 1860), of Cardiff, David Morgan of Swansea was the contractor. It cost £3,120. the money being raised by national subscription organised by the Rev T Thomas of Llandovery. 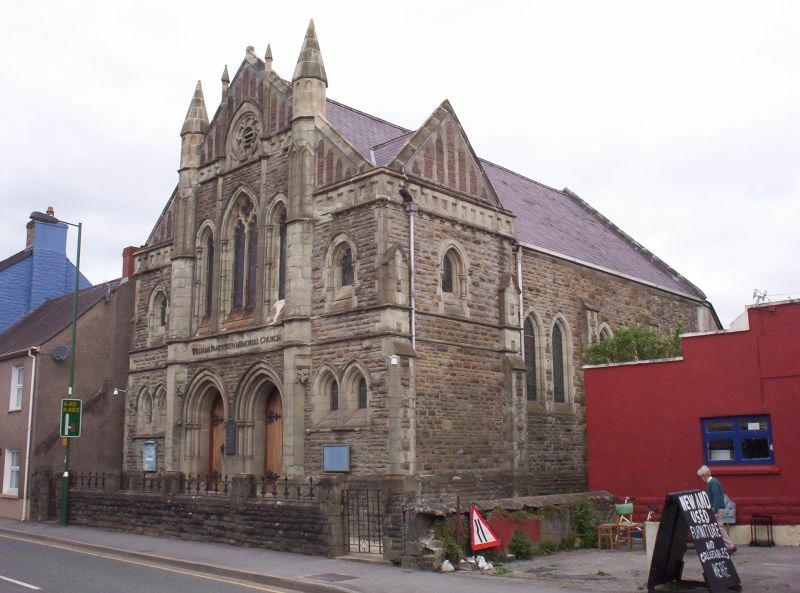 The chapel is a remarkably ecclesiastical design, noted in 1888 as 'remarkable as one of the first, if not actually the first, Welsh Calvinistic Methodist places of worship into which works of art have been admitted'. This referred especially to the 4 stained glass windows and carved Caen stone pulpit. The communion table and chairs were a gift from converts of the Khasi Hills, India, into whose language many of Pantycelyn's hymns had been translated by Welsh missionaries. The foundation stones were laid by David Davies MP of Llandinam and David Pugh MP of Manorafon, Llangadog. The chapel is 43' (13.11m) by 30', 27' (9.75m) high and holds 280, with a schoolroom for 80 scholars. The green Bridgend stone used for the dressings is much eroded 1999. Chapel, rock-faced grey Dunvant stone, with Bridgend green stone dressings and slate roof with coped gable. Ornate Decorated Gothic style. Gable front of 3 bays divided by ashlar piers with turret finials. Piers are 3-stage, square at lowest stage, broadened to three-sided on carved beast corbels just below first floor level. Double band under first floor, single band under third stage (at height of main window arches) which has panels with gabled hoods to each face, and finally finials have pointed panels to shafts and pointed octagonal caps. Broad centre bay has steps up to two pointed doorways, heavily moulded with double column shafts. Band above with inscription, the main windows are stepped, big stone traceried 2-light centre window with narrow single lancets each side, all heavily moulded with column shafts. Triangular-section narrow shafts flank centre window, rising through gable above. Traceried band under gable each side of blank sexfoil in ashlar pointed surround, the flanking triangular shafts rising to small finials. Gable has unusual flush cusped pointed panels of purple stone in green sandstone ashlar. Side bays have similar purple flushwork in upper triangles, over an ashlar band with inset square panels. This band corresponds to springing level of centre windows. First floor short single light, moulded and column-shafted with chamfered ashlar sill down to upper course of a double dripcourse (continued from top and bottom mouldings of centre inscription band). Ground floor has small pair of similar windows, without angle shafts, with deep chamfered sills and conjoined hoodmoulds. Stone flagstones and steps in front behind rubble low wall with low iron railings. Returns each side have a flushwork gable, and first floor single light as on outer bays of front. The following 3 bays are plain with double pointed window to each bay and simple buttresses between. Big rendered rear lean-to. Unusually ecclesiastical Gothic interior, notable three-sided apse with boarded timber vault, separated from the body of the chapel by a Gothic 'chancel arch' with short column corbels. To left of arch, in the church position, is a highly carved Gothic pulpit in Caen stone, with stone steps up. Five sides, ornately carved Gothic panels with column shafts, the inner column shafts in pink marble. Finely carved reliefs in the panels of the life of Christ, and one relief of William Williams. To each side of arch is segmental-pointed doorway to rear vestry. In apse instead of centre pulpit is small ornate Gothic harmonium. Broad main body of chapel with pews in 3 blocks. Boarded 3-sided roof with trusses on carved corbels. Trusses have 2 collars both arch braced, and turned king strut between collars. Flat ceiling above upper collar. End wall gallery over entrance lobby on 2 octagonal timber columns with brackets to cornice and pitch-pine panelled front of large square panels under pairs of small square panels. Lobby has leaded 3-light wooden window and 2 double doors. Raked gallery pews, and in gallery fine stained glass windows of 4 lights: Isaiah and St Matthew to centre, flanked by King David and Miriam; in memory of Ieuan Gwyllt, the Rev Thomas Phillips and Ann Griffith, attributed to Cox & Son. Included as an unusually elaborate Gothic chapel designed by a leading Cardiff architect. Fine interior with remarkable amount of figurative detail, including carved pulpit and stained glass. Of historical significance as a memorial to William Williams Pantycelyn, C18 preacher and hymnist. Situated in terraced row, opposite Williams Memorial Chapel. Situated in terraced row about midway between Castle Street and Bridge Street. Situated opposite the Williams Memorial Chapel. Situated in terraced row on street line near middle of row opposite No 18. Situated in front of forecourt to bank, some 80m E of junction with Stone Street. Situated set back in own forecourt some 80m E from junction with Stone Street. Situated opposite Lloyds Bank, about 60m E of junction with Castle Street. Situated at end of the terraced row 3-23 High Street.